Books are an important part of the holidays for me. As a child, my siblings and I would all huddle round while we read the same children’s stories every year, even as we grew into our teens and even adulthood. Tradition is tradition. Children’s Christmas stories hold a very special kind of magic to instill the holiday spirit. Here are 25 wondrous Christmas books for kids. The Herdman kids are many things, but well-behaved is not one of them. In this first book of the series, the siblings participate in the local Christmas pageant and naturally, shenanigans ensue. Described as “Lemony Snicket meets Elf,” this story follows Nikolas, who ventures to the North Pole in search for his missing father. Along the way he encounters threats as dark as any fairytale, but manages to end with a heaping dose of Christmas cheer. This sweet and lyrical telling of the first Christmas is a great way to introduce young ones to the Nativity story, complete with sweet, colorful illustrations. Anja wishes to be one of Santa’s elves, so she dons her snowshoes and heads off to pursue her ambition. Compared to The Polar Express and The Snowman, this Nordic tale is filled with wonder and warmth. For fireworks in Brazil to Sinterklaas in the Netherlands to mango trees in South Africa, this book inspired by the Disney World ride celebrates Christmas traditions from all over the world. Wishing for snow, a farmer naps on Christmas Eve and dreams of a snowstorm blanketing his farm, then wakes to find it has come true! Then he creates a musical celebration for children everywhere. From the favorite children’s author of The Very Hungry Caterpillar. 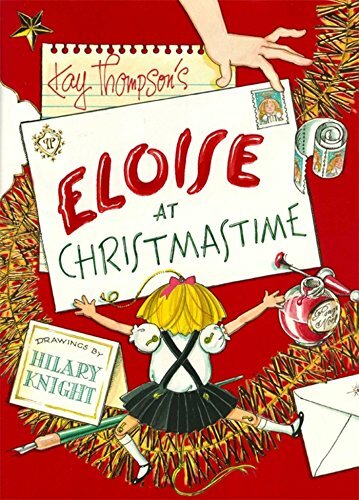 This beloved little troublemaker takes it upon herself to spread Christmas cheer (and ample chaos) throughout the Plaza Hotel in this more recent addition to a children’s classic. We have to include this non-negotiable Christmas children’s book classic. I declare it to be impossible to read this story about Whoville’s most terrible Christmas crank without your heart growing three sizes. A scheming story of how to catch a Christmas elf told in playful rhyme that makes it an instant modern classic—a New York Times and USA Today bestseller. It’s easy to see how the misunderstanding took place—Magnolia’s dad said they were going to meet a man with a beard, a red suit, a bag full of treasures. But it turns out Santa isn’t a pirate. The fourth in a New York Times bestselling series. Nina isn’t used to humid heat at Christmas, and with her Grandmother in Miami she misses the New England snow she is used to. But as she learned about her Cuban heritage, her eyes are opened to an incredible Noche Buena. A young girl presents the gift of a poinsettia to the Christ Child, making it Mexico’s flor de la Nochebuenao—flower of the Holy Night. An adaptation of a Mexican legend from a renowned, multi-award-winning author. If this title doesn’t catch your attention, well, I have no more tricks up my sleeve. A rhyming board book that delivers on the humor promised by the title, as you and your little one join little llama in fun Christmas traditions. The parson is sick, and the Christmas Eve service is cancelled. But Mouse is determined to give the town its nativity scene, and sets off a chain reaction of hope and love. In this adaptation of the Christmas classic from a Choctaw and Cherokee author and Cherokee illustrator, Old Red Shirt comes by night in his sleigh pulled by flying white buffalo. Winner of the 2010 Moonbeam Award for Holiday Books. A retelling of the traditional tale set in the Harlem Renaissance, inspired by jazz and illustrated by a Coretta Scott King Award–winning artist. This story follows a girl’s adventures through an enchanted world as she finds her voice. Olivia is very busy waiting for Santa and overseeing her parents to ensure all critical Christmas tasks are completed. A sure win for fans of the Caldecott-winning Olivia series. Another beloved classic and Caldecott Award winner. On Christmas Eve, a boy who is doubting his holiday spirit gets a rare chance to hop on board the Polar Express direct to the North Pole, and receives a gift to reignite his faith in Christmas forever. This 30th anniversary edition features new enriched finishes and an author’s note. All the other mice are sealing themselves in their homes in preparation for the coming snow, but Robert the mouse slips outside from his leaky old leather boot, eager to play in it. He becomes lost, and finds aid from a big animal with red fur. Later, his family is mysteriously brought a much-needed brand new boot. Another beloved classic following a little boy and his animated snowman on an incredible adventure though a Winter Wonderland. Maria and her cousins desperately try to cover her after she borrows her mother’s beautiful diamond ring…and loses it in the Christmas tamales. As they hunt for the treasure amidst the feast, a family pulls together. After playing outside on an ice-cold pond, a Japanese boy warms up inside. As he does, he watches his mama dig up the pine tree that was planted when he was born, bring it inside, and decorate it in paper cranes. A gorgeously illustrated Christmas poem that tells a story of Christmas Eve from the eyes of an African American child, full of sentiment, family and heartwarming wonder. From a Coretta Scott King Award–winning author. When Teeka’s stern methods to prepare Santa’s magic reindeer does nothing but make matters worse, she must get creative to find a better way. What are your favorite Christmas books for kids?